To speak with one of our friendly customer service representatives give us a call at(800) 915-3535 today! Everyone can use a pencil or pen at some point, and have an extra can help too. So custom printed pencils and pens make great promotional items any time of year. They are cost-effective advertisements that can be used at any event. There several styles of custom printed pencils to choose from and quantities for any application. When you advertise with custom printed pencils, your customers will have your business name and info in their grasp. Are you trying to reach a specific type of client? A custom printed pencil can help you do that. Pencils come in a variety of styles that are ideal for certain situations. Say you want to reach golfers, golf courses, or even churches, why not send them a box of custom printed golf pencils! That shows that you are looking are for their needs, while passively advertising too. Promotional carpenter pencils are perfect for construction companies, architects, woodworkers, and similar industries. The traditional round or hex pencil is a great option for schools, libraries, or education centers. No matter who your market is a custom pencil can be selected to match it. Custom printed pens are a great way to reach office or mobile professionals. Pens are ready to ready to use and never dull like a pencil. Which is perfect for someone on the go. 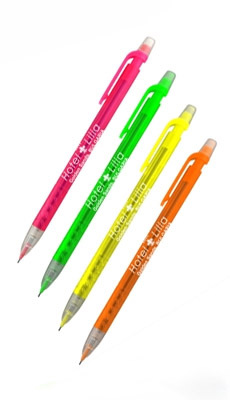 We carry promotional stick pens, click pens, and grip pens. All of which can be custom imprinted with your logo, business name, or both! Feel free to browse the products on this website and give us a call at 800-915-3535! Our friendly customer service representatives are ready to help you get the promotional pencils and pens that you need to make your next advertising campaing a huge success! Want more information? Click the button below to request a free catalog on some of the products we offer!